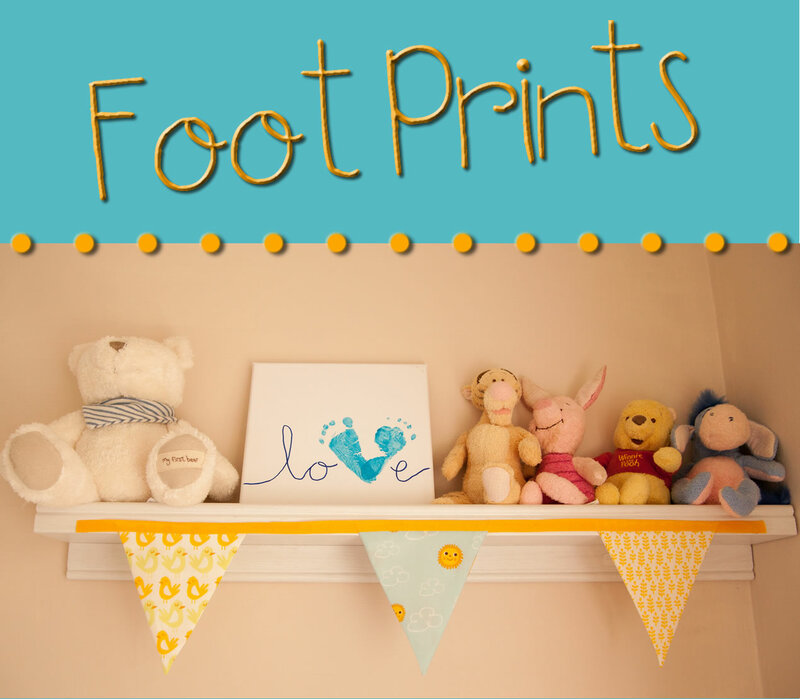 I've shown some of this before when I wrote about our small nursery design, but I wanted to write a post about the crafts I did before and after my baby was born. I saw some ideas on Pinterest for name plaques and liked the idea of a balloon and the name below. I used a hot glue gun to stick the buttons and letter tiles. I already had buttons in the house, so I picked out the colours I wanted, I chose blue, grey and mustard colour. The scrabble tiles I purchased from eBay. They were only a few pounds for a couple of sets of the alphabet. I first set everything out on the canvas board the way I wanted it to look. Then once I was happy I started glueing each item. I used some natural string to attach the buttons (balloon section) to the name tiles. To finish it off I glued a short piece of ribbon to the top of the canvas to hang the plaque. It now hangs on my boys nursery door. 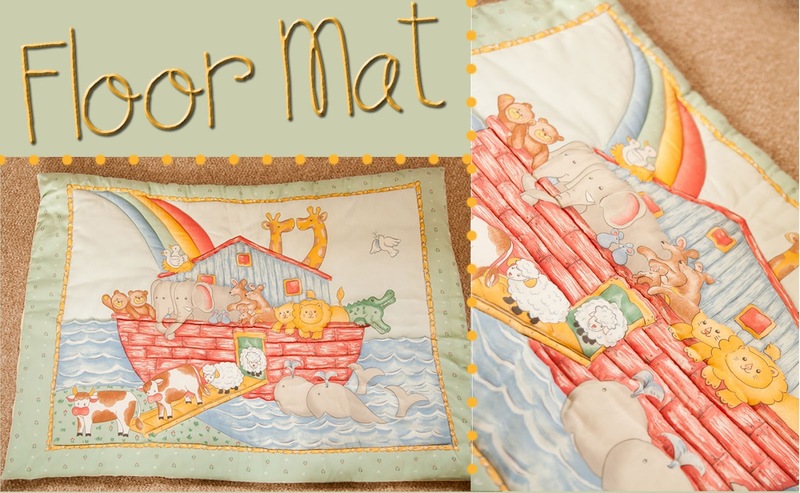 When purchasing items for the nursery I found a cot tidy on eBay that I liked and was a good price. It just happened to also come with a set of curtains and curtain tie backs. The curtains were too thin, but they were the right colour to match the room. 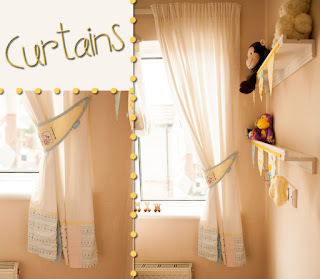 I decided to use the trim at the bottom of the curtains and add them to the cream curtains we already had up. I cut the trim from the original curtains and using a sewing machine sewed the trim to the cream curtains. With the addition of the tie backs, the cream curtains now looked fit for a nursery. I've not waisted the material left over from the curtains I purchased as you'll see below. 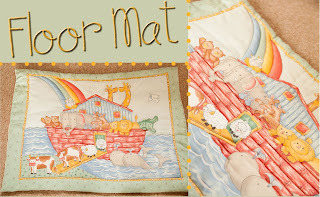 Many years ago I purchased this Noah's Ark material with the idea of using it at some point. When I found out I was pregnant I knew it was now or never. I first purchased wadding to pad out the mat. I decided on having it double layered so it was more comfortable for my baby and I'm pleased I did. It seemed thick at first, but it's just about right now that it's been used and washed. I cut my wadding to size and tacked it with thread to the back of the material. I thought about just using pins to attach it, but it was far easier to sew afterwards because I'd tacked it. Then using the sewing machine I sewed along different lines to give the picture definition, such as the rainbow and waves. I didn't go around the animals as this would have taken forever and would have been very fiddly. Once I was happy with how the picture looked with what I had sewed, I then sewed along the yellow frame around the edge. This part was important to keep the wadding in place after the back material was sewn on. Then using the left over material from the curtains I purchased I attached a back to the mat. I sewed the material to the front of the mat with the sewing machine leaving a gap so it could be turned the right way round. Then hand sewed the opening. I'm so pleased I got this mat finished. It's used on a daily basis, more than his play gym as my boy likes the freedom of moving around. I can also easily pack this up and take it when visiting friends and family. Again this is an idea I'd seen on Pinterest so wanted to give it a try. I purchased a white canvas board and some finger paints. I chose finger paints hoping this would be gentle enough for my babies skin as he was under 2 weeks old when we did this. This wasn't the easiest to do, as with most babies he was a wriggler. The key is to get the foot prints to look like a V, so you need to overlap the heel part. Once the foot prints were on the canvas and I was happy, I let it dry before adding the other letters. I used a sharpie pen to write the l o and e. This now sits on the shelf above my boys cot, next to a few of his teddies. The bunting was made for us by a friend. *Some links may contain affiliate links, you won't be charged anything extra for clicking on the link. I will just earn a small commission if you purchase which helps in the running of this blog. 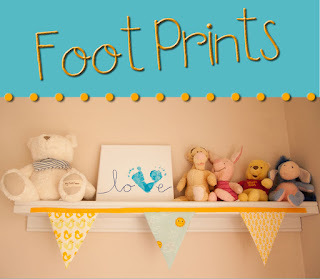 Such cute little touches, I love homemade decor.